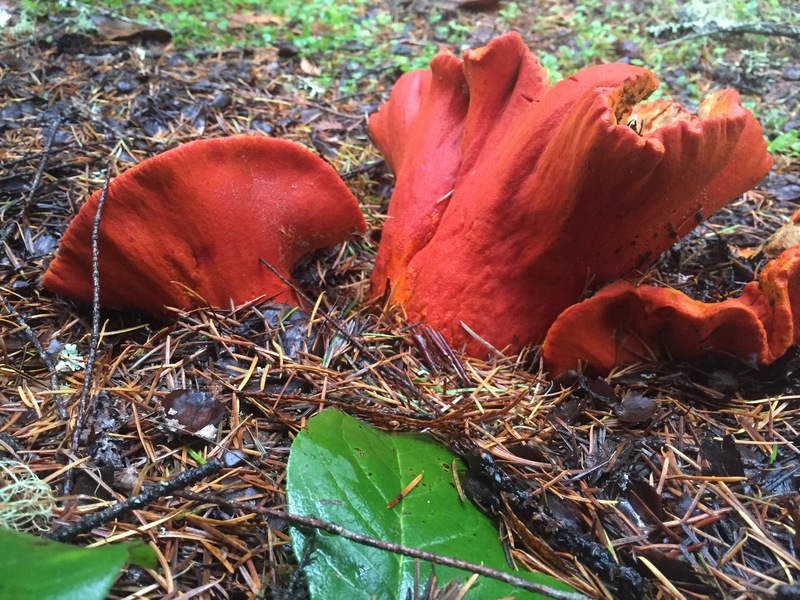 Description: Firm bright orange to orange-red surface, sometimes pimply; dense granular or brittle white flesh; stunted or absent gills; distorted cap; other characteristics similar to larger Russula or Lactarius spp. Habitat: Wherever Russula brevipes or Lactarius piperatus grow; generally woods & fringes; early to mid fall after first rains. Primary Keys: Medium to large, bright orange color, stunted or absent gills, malformed growth, ‘mushroom’ smell when young, shellfish smell when old. Comments: This is not actually a mushroom, but rather an ascomycete fungus parasitizing a basidiomycete mushroom. It generally hosts on our common large white Russula, and frequently appears only as ‘mushrumps’ with a bit of orange showing. It needs thorough cleaning of the surface, any brown/black spots pared away, and any internal discolorations or worm damage removed. Its white-to-yellow cottony cousin – Hypomyces chrysospermus – is the one you curse as it eats your favorite Bolete. Notes: Almost every field guide warns that this mushroom might cause intestinal upset due to unknown hosts. However, there are no recorded cases of illness, and these are now sold commercially in grocery stores. Saute green beans in butter over medium high heat for 1 minute. Add mushrooms & saute for 1 minute. Add shallot and marjoram, saute 1 minute. Add sherry and stock, reduce over high heat until thickened, 2-3 minutes. Add hazelnuts, salt and pepper to taste. Serve with grilled chicken or fish, and polenta or risotto.